Acupuncture therapy is becoming much more commonly practiced in veterinary medicine than ever before. It was first used in animals over 2000 years ago in China. Today, veterinarians all over the world are using acupuncture as therapeutic and restorative treatments for patients in their care. Acupuncture is a versatile tool that can be effective when treating many different conditions. Acupuncture uses very small needles of a specific size to stimulate certain points on an animal’s body. Different points are stimulated depending on what condition is being treated. These points are called “acupoints”. According to traditional Chinese medicine, there are 173 acupuncture points in animals. More technically, acupoints are generally found in areas that have a high amount of nerve endings or cells. Many acupoints are located around or on motor points. (Hips, shoulders, back, knees) When an acupoint is stimulated, endorphins are released throughout the body, causing relaxation of an affected area, and pain relief. Acupuncture at South Trail Animal Hospital is used in conjunction with standard veterinary medicine. It is safe and relatively pain free. Each acupuncture session may last thirty minutes to one hour. Multiple treatments are usually necessary, depending on the severity of the problem. Most animals are very comfortable with acupuncture treatment as the endorphins released also act as stress relievers. Acupuncture is not indicated in patients that are pregnant, or have open wounds or infectious diseases. 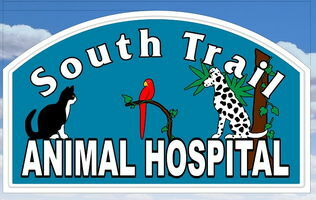 Dr. Eleanor Cooke is South Trail Animal Hospital’s veterinary acupuncturist. She graduated from Tuskegee University and has been working in small animal practice for many years. She took her acupuncture training at the Chi Institute for Traditional Chinese Veterinary Medicine in 2015. If you are interested in an acupuncture consultation, please call (239) 481-3525 to schedule an appointment.